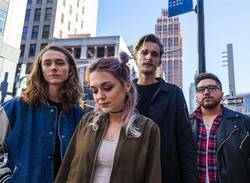 Detroit four-piece Lilac Lungs aimed to create a safe space with their recently released debut album Eventide, which confronts fears and friction that's buffered by the band's upbeat, indie pop sound. 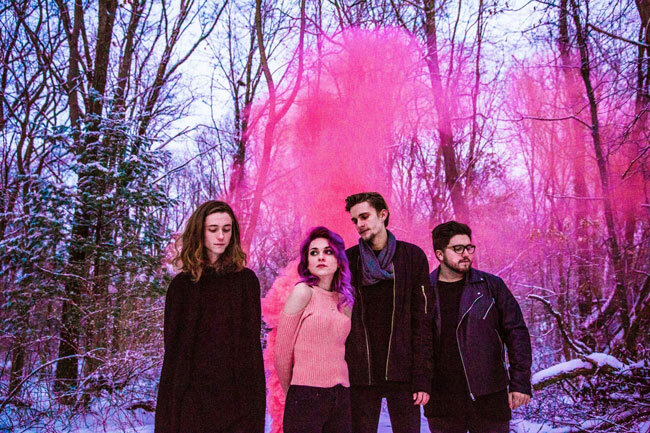 The quartet formed a year ago, and already had a self-titled EP to their name before Eventide came to fruition. The band's latest single "Uh Oh" contains splashes of summery guitar licks alongside lyrics hinting at inner turmoil ("Born into a family with secrets/ Fighting tooth and nail"), and offers a snapshot of the dark themes that appear throughout the band's LP. Consisting of Emily Torres on lead vocals, Johney Birrell on vocals and guitar, Terrance Elizondo on bass and Matt Jones on drums, the band have formed a tight unit which becomes apparent through the cohesive sound of Eventide. Johney took some time out to speak to SPB about how the album was made, and the impact he hopes Eventide will have. Scene Point Blank: Do you feel that growing up in Detroit has had any impact on your sound? Johney Birrell: Detroit is full of blue-collar, hardworking people, so watching everyone work so hard for what they believe in definitely influenced us as a band. Maybe not the sound of our music, but the work ethic of our band as a whole. "We want to be the band that we needed in trying times in our lives." Scene Point Blank: You recently released your debut album. How does it feel to finally have a full album of your music out there for the masses? Johney Birrell: It feels surreal still. It doesn't feel like it really could be happening, but we couldn't be more excited to release our art for everyone to experience. Scene Point Blank: Did you find anything particularly difficult during the recording process? Johney Birrell: As a fresh band, we had to work through the kinks of working together as a unit, but after we got through miscommunication issues it was a breeze. We're grateful to be doing what we all love, so there's nothing we won't be able to work out. Scene Point Blank: A lot of the songs, such as "Uh Oh" and "Fallen For Your Face" give the impression of feeling trapped in a trying situation. Was this intentional? Johney Birrell: Yes, everything we talk about in our songs is very intentional and has a specific meaning and purpose. We write through life experiences, and what we feel needs to be said in this world that people don't necessarily like to talk about -- like personal or difficult emotions to handle. Scene Point Blank: The album deals with tremendous difficulties but the closing song seems to be a defiant battle cry, so do you relate more to the powerful closing song or the more confronting songs on the album? Johney Birrell: I think we can equally relate to both aspects that you just stated. We all want to conquer our fears in this world, so we'd hope that everyone can connect with the powerful and confident aspect of our closing song. At the same time, it is also completely normal and human to connect with the more confronting songs. It's good to connect with both as humans, but in the end we want everyone to feel at peace, and like they've conquered their fears and anxieties in this world. Scene Point Blank: Vocally and lyrically, did you have to push yourself out of your comfort zone for Eventide? Johney Birrell: Definitely. Emily had to hit some amazingly high notes on this album. She hit the absolute top of her range, comfortably and with ease, in one of our songs, and every time she performs it live we all get goosebumps. I also sang way more on this album, which I'm not too comfortable with, but it was definitely something that I enjoyed and got used to very quickly. Lyrically, Emily always writes from personal experience, which can be very vulnerable and difficult to handle at times, so it at times it was a bit difficult to work through some of the lyrics, especially because some of them are still so fresh. But, everything that is said on this album is completely intentional and has a meaning. Scene Point Blank: Lastly, what do you hope people will take away from listening to your album? Johney Birrell: As a band we want to convey messages of hope and meaning to our listeners. We want to be the band that we needed in trying times in our lives. Everyone has purpose on this Earth, and if we can get people together from all over the world to connect and love one another, then we can hopefully show our listeners that they have a very specific purpose in life, and their meaning in this life will never be replaceable. Words by Aideen on July 4, 2017, 3:18 p.m.
Posted by Aideen on July 4, 2017, 3:18 p.m.